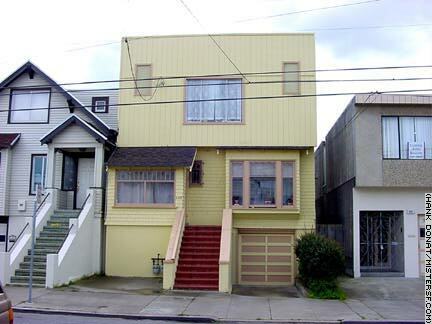 625 Morse Street The astonishing public odyssey of publishing heiress Patty Hearst began two and a half decades ago and continues to the current day. San Franciscans were stunned when the 19 year-old granddaughter of publishing baron William Randolph Hearst was kidnapped from her apartment at 2603 Benvenue Avenue in Berkeley by the leftist Symbionese Liberation Army. Even more unexpected were images of the machine gun-toting child of privilege in surveillance footage as she and her kidnappers robbed the Hibernia Bank at the corner of Noriega and 22nd in San Francisco just two months later on April 15, 1974. In conjunction with robbing the bank (now a Hollywood Video), the SLA released tapes in which Patty denounced her capitalist roots, changed her name to Tania, and announced she had joined the group whose motto was, "Death to the fascist insect that preys upon the life of people." Hearst was used as leverage to extort six million dollars in food for the poor from her wealthy family. The public anxiously followed the story of a political kidnapping by terrorists in America and debated Patty's role in the dramatic events. The SLA's radical mission to free the planet from oppression was short lived. About a month after the Hibernia Bank robbery more than 500 armed officers descended upon a South Central Los Angeles bungalow for a shoot out with the SLA whose members had assassinated Oakland school Superintendent Marcus Foster in addition to the Hearst kidnapping and other crimes. The bungalow burned to the ground with six SLA members inside. Patty's adventure continued as she was shuttled between SLA safe houses, including one at 1235 Masonic Street, for a year before being arrested in San Francisco at 625 Morse Street near the border of Daly City. In spite of her defense that she participated only under duress (she was locked in a closet for weeks), Patty was sentenced to seven years for armed robbery following a sensational trial in which she was defended by noted attorney F. Lee Bailey. After 22 months her sentence was commuted by President Jimmy Carter. Hearst wrote a book about her experience with the SLA then went on to act in films, including several directed by John Waters. In 2000 Hearst appeared as the distraught mother of a young member of a group of cinema terrorists who kidnap Melanie Griffith's movie star character and force her to participate in crimes before recruiting her as a willing follower in Waters's film Cecil B. Demented. Hearst was pardoned for her crimes by President Bill Clinton during the final days of his administration. Former SLA member Kathleen Soliah was arrested in a 1999 traffic stop after hiding for 24 years as Sara Jane Olsen and living an exemplary life in a Minneapolis suburb. Hearst claimed in her book, "Every Secret Thing" that Soliah participated in the 1975 hold up of the Crocker National Bank in Carmichael, California. Bank customer Myrna Lee Opsahl was killed during the robbery. In October, 2001 Soliah pled guilty to conspiracy for helping to plant bombs - which did not go off - under Los Angeles police patrol cars in 1975. In January, 2002, Soliah and others were charged with the murder of Opsahl. Defendants Bill Harris, Emily Harris Montague, Michael Bortin, and Soliah pleaded guilty to second-degree murder on November 6, 2002 and were sentenced to six to eight years in prison. James Kilgore, the last remaining SLA fugitive, was arrested in Cape Town, South Africa, two days later. Kilgore pleaded guilty to possessing a pipe bomb and, on May 13, 2003, plead guilty to Opsahl's murder as well. Patty Hearst Shaw and her husband Bernard Shaw live in Connecticut with their two daughters.